Setting up an aquarium does not end with choosing one. In fact, that is just the beginning. You will have to choose aquarium decorations to put in it. If you happen to be new to the world of aquariums, you might be wondering what could be the purpose of these aquarium decorations. First, of course, aquarium decorations will make your aquarium look better. If you decorate it well, your aquarium has the potential to be a great accent just about anywhere you want to put it. But making an aquarium attractive is not the only purpose of aquarium decorations, they also serve as a way for a fish to feel more at ease in the aquarium. So as you may have already gathered, choosing the right aquarium decorations is important and not at all as easy as it sounds. That’s why we listed out some of the best aquarium decorations to help you. 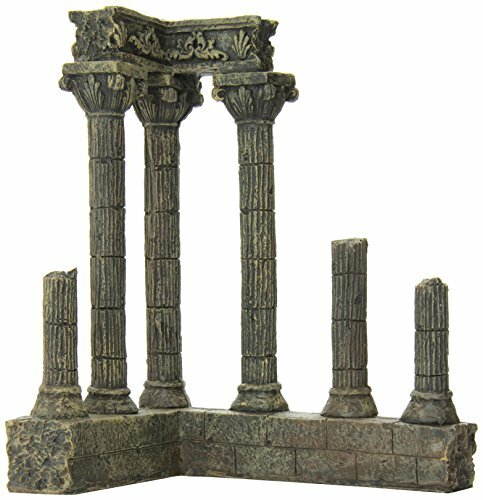 This 8 piece set of granite stone replicas has a realistic shape in shades of grey and black. Set includes 3 small stones, 3 medium stones, and 2 large stones. This aquarium decoration provides visual interest for you and your fish. Holes provide a hideaway for your fish to rest or hide reducing stress and aggression. 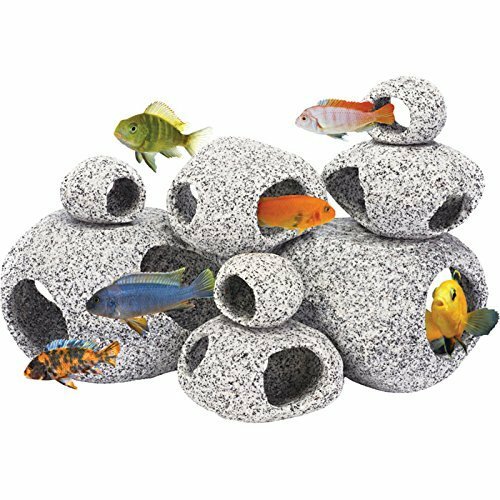 The Penn Plax Stone Replica Aquarium Decoration is perfect for an aquarium that houses types of fish that live under the sea. The decoration, which consists of 8 pieces of granite stone replicas in 3 different sizes, resembles things that you’ll find in the ocean. It’s great especially for types of fish that need to have individual spaces. Since the stones are separate, you can arrange them the way you like. You can easily arrange them to fit in the tank, no matter what the size. You can also purchase more to add onto it. 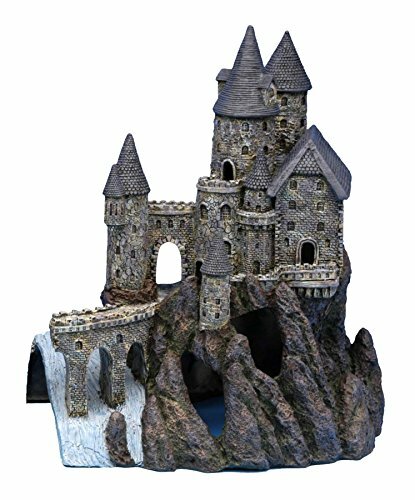 This aquarium decoration features a large grey castle perched upon a rocky hill with a flowing waterfall underneath. The cone shaped roof, archways, and stone details give a realistic feel. This castle provides visual interest for you and your fish. Holes provide hideaways for your fish to rest and passageways to reduce boredom. This aquarium ornament measures 12.8 inches across by 14.8 inches high by 8 inches deep. Castle is doubled sided and can be placed anywhere in your fish tank. The next on our list of the best aquarium decorations will appeal not just to the fish but also to those viewing the aquarium. The Penn Plax Castle Aquarium Decoration is designed to look like a realistic castle. The holes and passageways incorporated on the design provides the fish with spaces to rest and play. It measures 12.8 inches across by 14.8 inches high by 8 inches deep. It’s freestanding and you can place it anywhere in the aquarium. This aquarium decoration can be safely used for salt and fresh water. Mangroves can be seen growing along deltas, shores, and rivers. They can grow in both salt and fresh water and used by the fish in those waters as a habitat. That is what this next aquarium decoration used as an inspiration. The Marina Decor resembles the true mangrove roots you will find in nature. It’s made with safe and completely non-toxic materials. It measures 12.7 inches wide x 11.2 inches long x 9 inches tall and its structure and placement is very stable and secure. The Aquatic Creations Corner Columns is an aquarium decoration that can be used for both salt or fresh water. The design resembles ancient ruins that will definitely add a certain vibe to the aquarium. You can place it in a corner of an aquarium as long as its size ranges from medium to large. Every material used for this decoration is non-toxic and completely safe. The shelter is provided will reduce the stress felt by the fish. Offers the natural environment feeling. - Change your aquarium into a beautiful scenery . It is vividly and color detailed to add lively and natural life to your tank. - It is great to decorate your aquarium all the time with minimum responsibility and maintenance. The last item on our list of the best aquarium decorations is definitely not the least of them all. 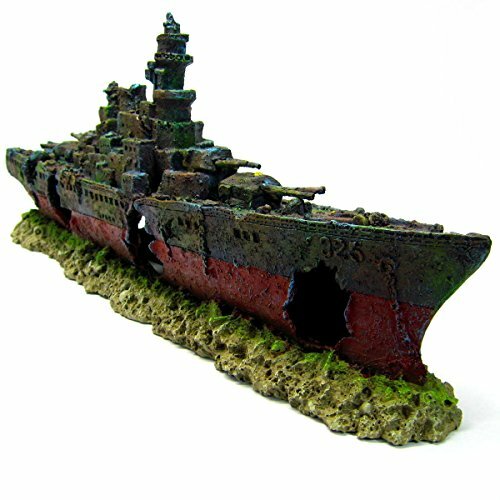 The NAVY Battleship ship decor Shipwreck PET is made to resemble the natural environment where fish usually reside. On top of that, it provides you a beautiful and lively scenery. It is made with plastic material that is safe for the fish and it requires minimum maintenance. It can be used for both salt and fresh water. This aquarium decoration measures approximately 19.3 inches in length by 3.6inches in width by 7.7 inches in height. 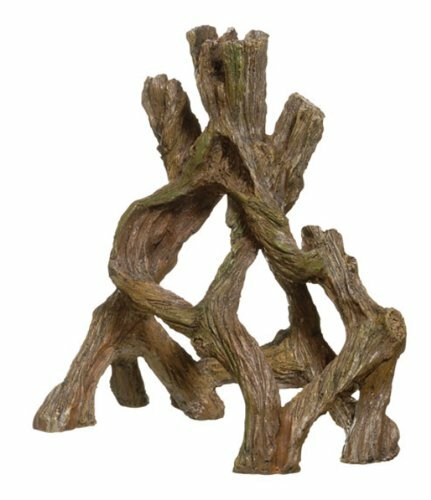 These Mangrove decorations are our top pick for the shelter they provide and their natural look they are a great addition to any aquarium! Choosing the best aquarium decorations can be hard especially if you are new to it. You can’t use the concept of one size fits all since different types of fish have different preferences. Sure, you are the one who will be looking at the aquarium but you have to keep in mind that the fish will have to live in it. You have to learn more about the preferences of the fish you keep so you have an idea about what to get. The most important thing to remember is that is the best aquarium decorations for a certain type of fish will resemble their natural habitat. The aquarium decorations you’ll buy will have a lasting effect on their health and behavior. If you happen to have any questions or suggestions, please feel free to leave them on the comments section!